Since 1848, the Swiss Confederation has been a federal state of relatively autonomous cantons, some of which have a history of confederacy that goes back more than 700 years, putting them among the world's oldest surviving republics. The early history of the region is tied to that of Alpine culture. Switzerland was inhabited by Gauls and Raetians, and it came under Roman rule in the 1st century BC. Gallo-Roman culture was amalgamated with Germanic influence during Late Antiquity, with the eastern part of Switzerland becoming Alemannic territory. The area of Switzerland was incorporated in the Frankish Empire in the 6th century. In the high medieval period, the eastern part became part of the Duchy of Swabia within the Holy Roman Empire while the western part was part of Burgundy. The Old Swiss Confederacy in the late medieval period (the Eight Cantons) established its independence from the House of Habsburg and the Duchy of Burgundy, and in the Italian Wars gained territory south of the Alps from the Duchy of Milan. The Swiss Reformation divided the Confederacy and resulted in a drawn-out history of internal strife between the Thirteen Cantons in the Early Modern period. In the wake of the French Revolution, Switzerland fell to a French invasion in 1798 and was reformed into the Helvetic Republic, a French client state. Napoleon's Act of Mediation in 1803 restored the status of Switzerland as a Confederation, and after the end of the Napoleonic period, the Swiss Confederation underwent a period of turmoil culminating in a brief civil war in 1847 and the creation of a federal constitution in 1848. The history of Switzerland since 1848 has been largely one of success and prosperity. Industrialisation transformed the traditionally agricultural economy, and Swiss neutrality during the World Wars and the success of the banking industry furthered the ascent of Switzerland to its status as one of the world's most stable economies. Switzerland signed a free-trade agreement with the European Economic Community in 1972, and has participated in the process of European integration by way of bilateral treaties, but it has notably resisted full accession to the European Union (EU) even though its territory has been surrounded by EU member states since 1995. Archeological evidence suggests that hunter-gatherers were already settled in the lowlands north of the Alps in the Middle Paleolithic period 150,000 years ago. By the Neolithic period, the area was relatively densely populated. Remains of Bronze Age pile dwellings from as early as 3800 BC have been found in the shallow areas of many lakes. Around 1500 BC, Celtic tribes settled in the area. The Raetians lived in the eastern regions, while the west was occupied by the Helvetii. In 58 BC, the Helvetii tried to evade migratory pressure from Germanic tribes by moving into Gaul, but were defeated by Julius Caesar's armies and then sent back. The alpine region became integrated into the Roman Empire and was extensively romanized in the course of the following centuries. The center of Roman administration was at Aventicum (Avenches). In 259, Alamanni tribes overran the Limes, putting the settlements on Swiss territory on the frontier of the Roman Empire. The first Christian bishoprics were founded in the fourth century. With the fall of the Western Roman Empire, Germanic tribes entered the area. Burgundians settled in the west; while in the north, Alamanni settlers slowly forced the earlier Celto-Roman population to retreat into the mountains. Burgundy became a part of the kingdom of the Franks in 534; two years later, the dukedom of the Alamans followed suit. In the Alaman-controlled region, only isolated Christian communities continued to exist and Irish monks re-introduced the Christian faith in the early 7th century. Under the Carolingian kings, the feudal system proliferated, and monasteries and bishoprics were important bases for maintaining the rule. The Treaty of Verdun of 843 assigned Upper Burgundy (the western part of what is today Switzerland) to Lotharingia, and Alemannia (the eastern part) to the eastern kingdom of Louis the German which would become part of the Holy Roman Empire. In the 10th century, as the rule of the Carolingians waned, Magyars destroyed Basel in 917 and St. Gallen in 926. Only after the victory of King Otto I over the Magyars in 955 in the Battle of Lechfeld, were the Swiss territories reintegrated into the empire. In the 12th century, the dukes of Zähringen were given authority over part of the Burgundy territories which covered the western part of modern Switzerland. They founded many cities, including Fribourg in 1157, and Bern in 1191. The Zähringer dynasty ended with the death of Berchtold V in 1218, and their cities subsequently became reichsfrei (essentially a city-state within the Holy Roman Empire), while the dukes of Kyburg competed with the house of Habsburg over control of the rural regions of the former Zähringer territory. Under the Hohenstaufen rule, the alpine passes in Raetia and the St Gotthard Pass gained importance. The latter especially became an important direct route through the mountains. Uri (in 1231) and Schwyz (in 1240) were accorded the Reichsfreiheit to grant the empire direct control over the mountain pass. Most of the territory of Unterwalden at this time belonged to monasteries which had previously become reichsfrei. The extinction of the Kyburg dynasty paved the way for the Habsburg dynasty to bring much of the territory south of the Rhine under their control, aiding their rise to power. Rudolph of Habsburg, who became King of Germany in 1273, effectively revoked the status of Reichsfreiheit granted to the "Forest Cantons" of Uri, Schwyz, and Unterwalden. The Forest Cantons thus lost their independent status and were governed by reeves. On 1 August 1291, the cantons of Uri, Schwyz, and Unterwalden united to defend the peace upon the death of Emperor Rudolf I of Habsburg, forming the nucleus of the Old Swiss Confederacy. By 1353, the three original cantons had been joined by the cantons of Glarus and Zug and the city states of Lucerne, Zürich, and Bern, forming the "Old Federation" of eight states that persisted during much of the 15th century. At the battle of Sempach 1386, the Swiss defeated the Habsburgs, gaining increased autonomy within the Holy Roman Empire. Zürich was expelled from the Confederation from 1440 to 1450 due to a conflict over the territory of Toggenburg (the Old Zürich War). The Confederation's power and wealth increased significantly, with victories over Charles the Bold of Burgundy during the 1470s and the success of Swiss mercenaries. The traditional listing order of the cantons of Switzerland reflects this state, listing the eight "Old Cantons" first, with the city states preceding the founding cantons, followed by cantons that joined the Confederation after 1481, in historical order. The Swiss defeated the Swabian League in 1499 and gained greater collective autonomy within the Holy Roman Empire, including exemption from the Imperial reforms of 1495 and immunity from most Imperial courts. In 1506, Pope Julius II engaged the Swiss Guard, which continues to serve the papacy to the present day. The expansion of the Confederation and the reputation of invincibility acquired during the earlier wars suffered a first setback in 1515 with the Swiss defeat in the Battle of Marignano. The Reformation in Switzerland began in 1523, led by Huldrych Zwingli, priest of the Great Minster church in Zürich since 1518. Zürich adopted the Protestant religion, joined by Berne, Basel, and Schaffhausen, while Lucerne, Uri, Schwyz, Nidwalden, Zug, Fribourg and Solothurn remained Catholic. Glarus and Appenzell were split. This led to multiple inter-cantonal religious wars (Kappeler Kriege) in 1529 and 1531, because each canton usually made the opposing religion illegal, and to the formation of two diets, the Protestant one meeting in Aarau and the Catholic one in Lucerne (as well as the formal full diet still meeting usually in Baden) but the Confederation survived. During the Thirty Years' War, Switzerland was a relative "oasis of peace and prosperity" (Grimmelshausen) in war-torn Europe, mostly because all major powers in Europe depended on Swiss mercenaries, and would not let Switzerland fall into the hands of one of their rivals. Politically, they all tried to take influence, by way of mercenary commanders such as Jörg Jenatsch or Johann Rudolf Wettstein. The Drei Bünde of Grisons, at that point not yet a member of the Confederacy, were involved in the war from 1620, which led to their loss of the Valtellina in 1623. At the Treaty of Westphalia in 1648, Switzerland attained legal independence from the Holy Roman Empire. 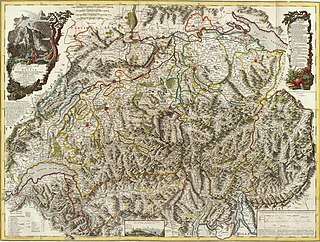 The Valtellina became a dependency of the Drei Bünde again after the Treaty and remained so until the founding of the Cisalpine Republic by Napoleon Bonaparte in 1797. In 1653, peasants of territories subject to Lucerne, Bern, Solothurn, and Basel revolted because of currency devaluation. Although the authorities prevailed in this Swiss peasant war, they did pass some tax reforms and the incident in the long term prevented an absolutist development as would occur at some other courts of Europe. The confessional tensions remained, however, and erupted again in the First War of Villmergen, in 1656, and the Toggenburg War (or Second War of Villmergen), in 1712. During the French Revolutionary Wars, the French army invaded Switzerland and turned it into an ally known as the "Helvetic Republic" (1798–1803). It had a central government with little role for cantons. The interference with localism and traditional liberties was deeply resented, although some modernizing reforms took place. Resistance was strongest in the more traditional Catholic bastions, with armed uprisings breaking out in spring 1798 in the central part of Switzerland. The French Army suppressed the uprisings but support for revolutionary ideas steadily declined. The reform element was weak, and most Swiss resented their loss of local democracy, the centralization, the new taxes, the warfare, and the hostility to religion. Major steps taken to emancipate the Jews included the repeal of special taxes and oaths in 1798. However, reaction took place in 1815, and not until 1879 were the Jews granted equal rights with the Christians. In 1803, Napoleon's Act of Mediation partially restored the sovereignty of the cantons, and the former tributary and allied territories of Aargau, Thurgau, Grisons, St. Gallen, Vaud and Ticino became cantons with equal rights. Napoleon and his enemies fought numerous campaigns in Switzerland that ruined many localities. The Congress of Vienna of 1814–15 fully reestablished Swiss independence and the European powers agreed to recognize permanent Swiss neutrality. At this time, Valais, Neuchâtel and Geneva also joined Switzerland as new cantons, thereby extending Swiss territory to its current boundaries. It proclaimed the equality of citizens before the law, equality of languages, freedom of thought and faith; it created a Swiss citizenship, basis of our modern nationality, and the separation of powers, of which the old regime had no conception; it suppressed internal tariffs and other economic restraints; it unified weights and measures, reformed civil and penal law, authorized mixed marriages (between Catholics and Protestants), suppressed torture and improved justice; it developed education and public works. On 6 April 1814, the so-called "Long Diet" (delegates from all the nineteen cantons) met at Zurich to replace the constitution. Cantonal constitutions were worked out independently from 1814, in general restoring the late feudal conditions of the 17th and 18th century. The Tagsatzung was re-organized by the Federal Treaty (Bundesvertrag) of 7 August 1815. The liberal Free Democratic Party of Switzerland was strong in the largely Protestant cantons obtained the majority in the Federal Diet in the early 1840s. It proposed a new Constitution for the Swiss Confederation which would draw the several cantons into a closer relationship. In addition to the centralization of the Swiss government, the new Constitution also included protections for trade and other progressive reform measures. The Federal Diet, with the approval of a majority of cantons, had taken measures against the Catholic Church such as the closure of monasteries and convents in Aargau in 1841, and the seizure of their properties. Catholic Lucerne, in retaliation, in 1844 recalled the Jesuits to head its education. That succeeded and seven Catholic cantons formed the "Sonderbund." This caused a liberal-radical move in the Protestant cantons to take control of the national Diet in 1847. The Diet ordered the Sonderbund dissolved, igniting a small-scale civil war against rural cantons were strongholds of pro-Catholic ultramontanism. The Radical-liberal-Protestant element charged that the Sonderbund was in violation of the Federal Treaty of 1815, §6 of which expressly forbade such separate alliances. Forming a majority in the Tagsatzung they decided to dissolve the Sonderbund on October 21, 1847. The odds were against the Catholics, who were heavily outnumbered in population; they were outnumbered in soldiers by 79,000 to 99,000, and lacked enough well-trained soldiers, officers and generals. When the Sonderbund refused to disband, the national army attacked in a brief civil war between the Catholic and the Protestant cantons, known as the Sonderbundskrieg ("Sonderbund War".) The national army was composed of soldiers of all the other cantons except Neuchâtel and Appenzell Innerrhoden (which remained neutral). The Sonderbund was easily defeated in less than a month; there were about 130 killed. Apart from small riots, this was the last armed conflict on Swiss territory. Many Sonderband leaders fled to Italy, but the victors were generous. They invited the defeated cantons to join them in a program of federal reform, and a new constitution was drafted along American lines. National issues were to be under the control of the national parliament, and the Jesuits were expelled. The Swiss voted heavily in favor of the new constitution by 2 million against 300,000. Switzerland became calm. However conservatives around Europe became frightened, and prepared their own forces to meet possible challenges, which indeed soon exploded the Revolutions of 1848. In those violent revolutions, outside Switzerland, the conservatives were always successful. As a consequence of the civil war, Switzerland adopted a federal constitution in 1848, amending it extensively in 1874 and establishing federal responsibility for defense, trade, and legal matters, leaving all other matters to the cantonal governments. From then, and over much of the 20th century, continuous political, economic, and social improvement has characterized Swiss history. While Switzerland was primarily rural, the cities experienced an industrial revolution in the late 19th century, focused especially on textiles. In Basel, for example, textiles, including silk, were the leading industry. In 1888 women made up 44% of the wage earners. Nearly half the women worked in the textile mills, with household servants the second largest job category. The share of women in the workforce was higher between 1890 and 1910 than it was in the late 1960s and 1970s. Swiss Universities in the late 19th century are notable for the number of female students receiving medical education. The major powers respected Switzerland's neutrality during World War I. In the Grimm–Hoffmann Affair, the Allies denounced a proposal by one politician to negotiate peace on the Eastern Front; they wanted the war there to continue so as to tie Germany down. While the industrial sector began to grow in the mid-19th century, Switzerland's emergence as one of the most prosperous nations in Europe—the "Swiss miracle"—was a development of the short 20th century, among other things tied to the role of Switzerland during the World Wars. League of Nations conference in Geneva (1926). Germany considered invading Switzerland during World War II, but never attacked. Under General Henri Guisan, the Swiss army prepared for mass mobilization of militia forces against invasion, and prepared strong, well-stockpiled positions high in the Alps known as the Réduit. Switzerland remained independent and neutral through a combination of military deterrence, economic concessions to Germany, and good fortune as larger events during the war delayed an invasion. Attempts by Switzerland's small Nazi party to cause an Anschluss with Germany failed miserably, largely due to Switzerland's multicultural heritage, strong sense of national identity, and long tradition of direct democracy and civil liberties. The Swiss press vigorously criticized the Third Reich, often infuriating German leaders. Switzerland was an important base for espionage by both sides in the conflict and often mediated communications between the Axis and Allied powers. Switzerland's trade was blockaded by both the Allies and by the Axis. Both sides openly exerted pressure on Switzerland not to trade with the other. Economic cooperation and extension of credit to the Third Reich varied according to the perceived likelihood of invasion, and the availability of other trading partners. Concessions reached their zenith after a crucial rail link through Vichy France was severed in 1942, leaving Switzerland completely surrounded by the Axis. Switzerland relied on trade for half of its food and essentially all of its fuel, but controlled vital trans-alpine rail tunnels between Germany and Italy. Switzerland's most important exports during the war were precision machine tools, watches, jewel bearings (used in bombsights), electricity, and dairy products. During World War Two, the Swiss franc was the only remaining major freely convertible currency in the world, and both the Allies and the Germans sold large amounts of gold to the Swiss National Bank. Between 1940 and 1945, the German Reichsbank sold 1.3 billion francs worth of gold to Swiss Banks in exchange for Swiss francs and other foreign currency. Hundreds of millions of francs worth of this gold was monetary gold plundered from the central banks of occupied countries. 581,000 francs of "Melmer" gold taken from Holocaust victims in eastern Europe was sold to Swiss banks. In total, trade between Germany and Switzerland contributed about 0.5% to the German war effort but did not significantly lengthen the war. Over the course of the war, Switzerland interned 300,000 refugees. 104,000 of these were foreign troops interned according to the Rights and Duties of Neutral Powers outlined in the Hague Conventions. The rest were foreign civilians and were either interned or granted tolerance or residence permits by the cantonal authorities. Refugees were not allowed to hold jobs. 60,000 of the refugees were civilians escaping persecution by the Nazis. Of these, 26,000 to 27,000 were Jews. Between 10,000 and 25,000 civilian refugees were refused entry. At the beginning of the war, Switzerland had a Jewish population of between 18,000 and 28,000 and a total population of about 4 million. Within Switzerland at the time of the conflict there was moderate polarization. Some were pacifists. Some took sides according to international capitalism or international communism. Others leaned more towards their language group, with some in French-speaking areas more pro-Allied, and some in Swiss-German areas more pro-Axis. The government attempted to thwart the activities of any individual, party, or faction in Switzerland that acted with extremism or attempted to break the unity of the nation. 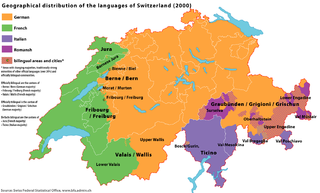 The Swiss-German speaking areas moved linguistically further away from the standard (high) German spoken in Germany, with more emphasis on local Swiss dialects. In the 1960s, significant controversy arose among historians regarding the nation's relations with Nazi Germany. By the 1990s the controversies included a class-action lawsuit brought in New York over Jewish assets in Holocaust-era bank accounts. The government commissioned an authoritative study of Switzerland's interaction with the Nazi regime. The final report by this independent panel of international scholars, known as the Bergier Commission, was issued in 2002. During the Cold War, Swiss authorities considered the construction of a Swiss nuclear bomb. Leading nuclear physicists at the Federal Institute of Technology Zurich such as Paul Scherrer made this a realistic possibility. However, financial problems with the defense budget prevented the substantial funds from being allocated, and the Nuclear Non-Proliferation Treaty of 1968 was seen as a valid alternative. All remaining plans for building nuclear weapons were dropped by 1988. From 1959, the Federal Council, elected by the parliament, is composed of members of the four major parties, the Protestant Free Democrats, the Catholic Christian Democrats, the left-wing Social Democrats and the right-wing People's Party, essentially creating a system without a sizeable parliamentary opposition (see concordance system), reflecting the powerful position of an opposition in a direct democracy. In 1963, Switzerland joined the Council of Europe. In 1979, parts of the canton of Bern attained independence, forming the new canton of Jura. Switzerland's role in many United Nations and international organizations helped to mitigate the country's concern for neutrality. In 2002, Switzerland voters gave 55% of their vote in favour of the UN and joined the United Nations. This followed decades of debate and its previous rejection of membership in 1986 by a 3-1 popular vote. Women's suffrage in Switzerland was introduced by popular vote in 1971. An equal rights amendment was ratified in 1981. Switzerland is not a member state of the EU, but has been (together with Liechtenstein) surrounded by EU territory since the joining of Austria in 1995. In 2005, Switzerland agreed to join the Schengen treaty and Dublin Convention by popular vote. In February 2014, Swiss voters approved a referendum to reinstitute quotas on immigration to Switzerland, setting off a period of finding an implementation that would not violate the EU's freedom of movement accords that Switzerland adopted. The order of precedence of the Swiss cantons given in the federal constitution follows the historical order of accession except for the three city cantons of Zürich, Bern and Lucerne placed at the top. ^ Julia Slater (September 10, 2007). "Prehistoric find located beneath the waves". swissinfo. ^ Hughes, Christopher, Switzerland (London, 1975) p.66 ff, 84. ^ Bonjour, Edgar et al. A short History of Switzerland (Oxford, 1952) p.191. ^ Marc H. Lerner, "The Helvetic Republic: An Ambivalent Reception of French Revolutionary Liberty," French History (2004) 18#1 pp 50-75. ^ Otto Dann and John Dinwiddy (1988). Nationalism in the Age of the French Revolution. Continuum. pp. 190–98. ISBN 9780907628972. ^ Wilhelm Oechsli, History of Switzerland 1499-1914, Cambridge University Press, 2013, p. 365. ^ Coolidge, William Augustus Brevoort (1911). "Switzerland/History/Constitution" . In Chisholm, Hugh. Encyclopædia Britannica. 26 (11th ed.). Cambridge University Press. p. 259. ^ William L. Langer, Political and social Upheaval 1832-1852 (1969): 133-37. ^ Regina Wecker, "Frauenlohnarbeit - Statistik und Wirklichkeit in der Schweiz an der Wende zum 20," Jahrhundert Schweizerische Zeitschrift für Geschichte (1984) 34#3 pp 346-356. ^ Holmes, Madelyn (1984). "Go to Switzerland, young women, if you want to study medicine". Women's Studies International Forum. 7 (4): 243–245. doi:10.1016/0277-5395(84)90048-7. Bonner, Thomas N. (Spring 1988). "Medical women abroad: a new dimension of women's push for opportunity in medicine, 1850-1914". Bulletin of the History of Medicine. 62 (1): 58–73. PMID 3285925. ^ Let's Swallow Switzerland by Klaus Urner (Lexington Books, 2002). ^ The Bergier Commission Final Report, page 238 http://www.uek.ch/en/. ^ The Bergier Commission Final Report, page 249 http://www.uek.ch/en/. ^ The Bergier Commission Final Report, page 518 http://www.uek.ch/en/. ^ Asylum in German, French and Italian in the online Historical Dictionary of Switzerland. ^ The Bergier Commission Final Report, page 117 http://www.uek.ch/en/. ^ Karacs, Imre (December 11, 1999). "Switzerland refused to help 24,500 Jews in war". The Independent. Retrieved February 4, 2009. ^ Hadrien Buclin, "'Surmonter le passé? ': les intellectuels de gauche et le débat des années soixante sur la deuxième guerre mondiale," ["Overcoming the Past? ": Intellectuals on the Left and the Debate of the 1960s About the Second World War] Schweizerische Zeitschrift für Geschichte (2013) 63#2 pp 233-249. ^ Banaszak, Lee Ann (1996). Why movements succeed or fail: Opportunity, culture, and the struggle for woman suffrage. Princeton, New Jersey: Princeton University Press. ISBN 9780691026398. ^ "Regional Portraits: Cantons". Neuchâtel, Switzerland: Swiss Federal Statistical Office. 2011. Archived from the original on April 30, 2009. Retrieved December 21, 2015. Lerner, Marc. A laboratory of liberty: the transformation of political culture in Republican Switzerland, 1750-1848 (Brill, 2011). Remak, Joachim. A very civil war. The Swiss Sonderbund War of 1847. (1993). Wikimedia Commons has media related to History of Switzerland. Wikisource has the text of the 1911 Encyclopædia Britannica article Switzerland/History. The canton of Schwyz is a canton in central Switzerland between the Alps in the south, Lake Lucerne to the west and Lake Zürich in the north, centered on and named after the town of Schwyz. The following is an alphabetical list of articles related to Switzerland. The Federal Charter or Letter of Alliance documents the Eternal Alliance or League of the Three Forest Cantons, the union of three cantons in what is now central Switzerland. It is dated in early August 1291 and initiates the current 1 August Swiss National Day. This agreement, in Latin, cites a previous similar pact. It is currently exhibited at the Museum of the Swiss Charters of Confederation in Schwyz. The canton of St. Gallen, also canton of St Gall, is a canton of Switzerland. The capital is St. Gallen. The canton of Thurgau is a northeast canton of Switzerland. 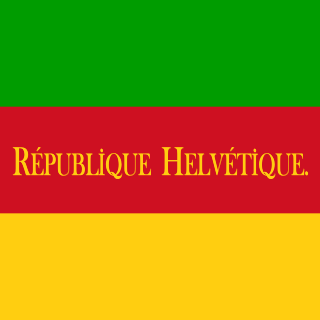 In Swiss history, the Helvetic Republic (1798–1803) represented an early attempt to impose a central authority over Switzerland, which until then had consisted of self-governing cantons united by a loose military alliance. The Sonderbund War of November 1847 was a civil war in Switzerland, then still a relatively loose confederacy of cantons (states). It ensued after seven Catholic cantons formed the Sonderbund in 1845 to protect their interests against a centralization of power. The war concluded with the defeat of the Sonderbund. It resulted in the emergence of Switzerland as a federal state, concluding the period of political "restoration and regeneration" in Switzerland. The Old Swiss Confederacy began as a late medieval alliance between the communities of the valleys in the Central Alps, at the time part of the Holy Roman Empire, to facilitate the management of common interests such as free trade and to ensure the peace along the important trade routes through the mountains. The Hohenstaufen emperors had granted these valleys reichsfrei status in the early 13th century. As reichsfrei regions, the cantons of Uri, Schwyz, and Unterwalden were under the direct authority of the emperor without any intermediate liege lords and thus were largely autonomous. The Protestant Reformation in Switzerland was promoted initially by Huldrych Zwingli, who gained the support of the magistrate and population of Zürich in the 1520s. It led to significant changes in civil life and state matters in Zürich and spread to several other cantons of the Old Swiss Confederacy. Seven cantons remained Roman Catholic, though, which led to inter-cantonal wars known as the Wars of Kappel. After the victory of the Catholic cantons in 1531, they proceeded to institute counter-reformatory policies in some regions. The schism and distrust between Catholic and Protestant cantons would define their interior politics and paralyse any common foreign policy until well into the 18th century. The rise of Switzerland as a federal state began on 12 September 1848, with the creation of a federal constitution in response to a 27-day civil war in Switzerland, the Sonderbundskrieg. The constitution, which was heavily influenced by the United States Constitution and the ideas of the French Revolution, was modified several times during the following decades and wholly replaced in 1999. The constitution represents the first time that the Swiss were governed by a strong central government instead of being simply a collection of independent cantons bound by treaties. The Second War of Kappel was an armed conflict in 1531 between the Protestant and the Roman Catholic cantons of the Old Swiss Confederacy during the Reformation in Switzerland. The periods of Restoration and Regeneration in Swiss history last from 1814 to 1847. "Restoration" refers to the period of 1814 to 1830, the restoration of the Ancien Régime (federalism), reverting the changes imposed by Napoleon Bonaparte on the centralist Helvetic Republic from 1798 and the partial reversion to the old system with the Act of Mediation of 1803. "Regeneration" refers to the period of 1830 to 1848, when in the wake of the July Revolution the "restored" Ancien Régime was countered by the liberal movement. In the Protestant cantons, the rural population enforced liberal cantonal constitutions, partly in armed marches on the cities. This resulted in a conservative backlash in the Catholic cantons in the 1830s, raising the conflict to the point of civil war by 1847. The Federal Treaty was the legal foundation for the new Swiss Confederacy of 1815. It came about after interventions by the great powers of the Sixth Coalition that defeated Napoleon. The Old Swiss Confederacy was a loose confederation of independent small states within the Holy Roman Empire. It is the precursor of the modern state of Switzerland. Christianity is the predominant religion of Switzerland, its presence going back to the Roman era. Since the 16th century, Switzerland has been traditionally divided into Roman Catholic and Reformed confessions. However, adherence to Christian churches has declined considerably since the late 20th century, from close to 94% in 1980 to about 66% as of 2017. Furthermore notable is the significant difference in church adherence between Swiss citizens (71%) and foreign nationals (50%) in 2017. Vogtei Rheintal was a condominium of the Old Swiss Confederacy from the 15th century until 1798. Its territory corresponded to the left banks of the Alpine Rhine between Hoher Kasten and Lake Constance, including the towns of Altstätten and Rheineck. The German-speaking part of Switzerland comprises about 65 percent of Switzerland. The First War of Villmergen was a Swiss religious war which lasted from 5 January until 7 March 1656, at the time of the Old Swiss Confederacy. On the one hand were the Protestant cities of Zürich and Bern, on the other the Catholic places in Central Switzerland. The Protestants tried to break the political hegemony of the Catholics, that had been in existence ever since the Second Kappel Landfrieden of 1531. The casus belli was the expulsion and execution of Protestants from the Schwyz commune of Arth. The Zürcher unsuccessfully besieged the Central Swiss-allied city of Rapperswil and thereby drove their forces together. The Bernese were defeated and repelled in the First Battle of Villmergen. The Third Landfrieden ended the conflict and restored the pre-war balance of power. Uri is a Swiss Talschaft and canton in the upper Reuss valley.